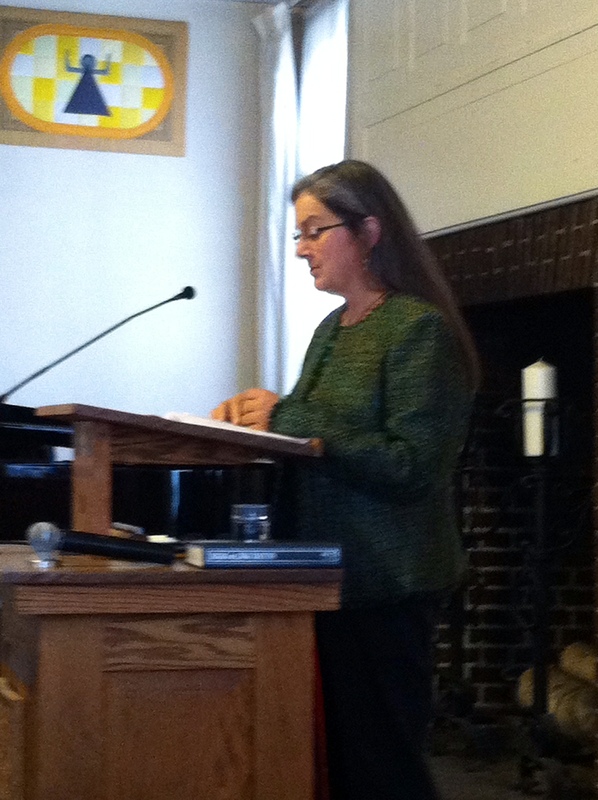 I gave a talk this morning at The Unitarian Universalist church of Pittsfield. It was part of a larger conversation about Health and Wellness Through Movement and Nutrition. It was fun to partner up with the church administrator, Kas Maroney who offers strength training and other exercise classes. 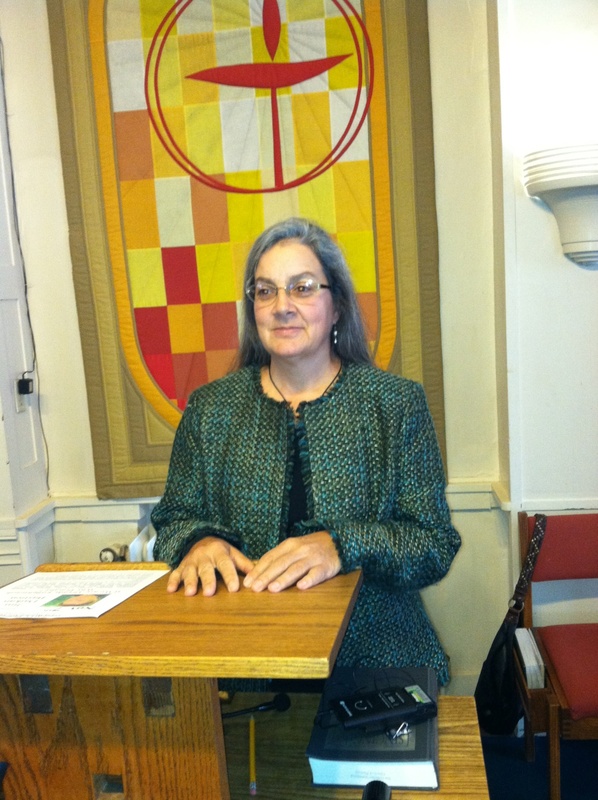 I will add an excerpt from the service for your reading pleasure. So how does nutrition contribute to having energy to do the things we like to do? Seems like a silly question doesn’t it. After all food and water are our life source, we all understand on some level that we can’t live without them. But it’s surprising how many people, including medical practitioners truly don’t consider the impact nutrition has on our health. When was the last time your doctor said “go home make a cup of tea (without sugar please) and vegetable barley soup and then go to bed early to catch up on your rest?” Rather we tend to believe and trust that there is a magic pill or medical procedure that can address whatever health issue arises. Therefore we don’t have to give much thought to how we eat and live our lives. In essence, we don’t have to take much responsibility in assuring we have good health because that’s someone else’s job. We live in a society where the idea of health is that you reach a certain age and your health begins to fail. We expect to become ill throughout our lives with common ailments such as flu or cold and many of us grow up believing that due to our genetics we will develop whatever ailment has plagued our family of origin. The science to support this thinking is sketchy at times and often funded by pharmaceutical companies who are going to make killing on our fears. It has become our cultural or societal norm to be bombarded by advertisements for the next wonder drug and then we find ourselves calling our doctors to ask if it is right for us. The good news is there is a simpler, less dangerous solution that can in fact improve health and vitality at any age. The truth is nutrition and lifestyle have everything to do with how healthy we are regardless of our genetics. 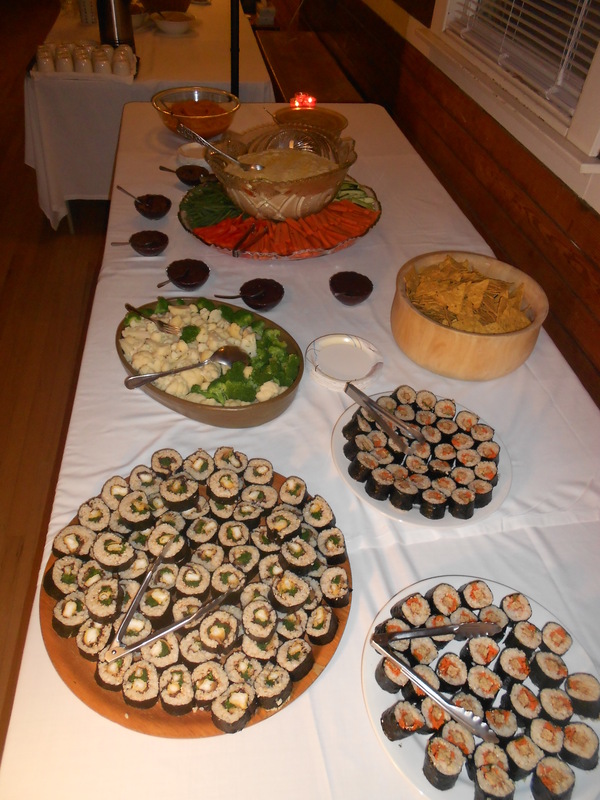 The student prepared feast at Kushi Institute’s Macrobiotic Leadership Program Level Ceremony! The growing chatter out there about eating healthy whole foods or real foods for health can get a bit confusing, however. Go into any book store and you will find numerous books on the topic and some contradict the one you just read. That has more to do with competing interests than it does with good information. Many of these books offer good solid information that really needs to be considered if we are to reduce the growing health crisis we experience not only here in the United States with diabetes, obesity, cancer and heart disease, but now in many other regions of the world where diet has changed and moved away from the foods that were traditionally eaten. Two of my favorite authors on the subject of healing through food include, Dr. Neal Barnard who I’ve eaten lunch with when he was visiting the Kushi Institute where I work part time, and Dr. Anne Marie Colbin, who I’ve had the pleasure of hearing lecture at The Institute of Integrative Nutrition where I am completing my studies as a health coach. These authors are among many authorities on gaining good health through diet. They have taken the time to learn and experience what a nutritious balanced diet can do for our overall good health. Dr. Barnard is the founder and president of The Physicians Committee for Responsible Medicine and is one of the leading advocates of health, nutrition and higher standards in research. Dr. Anne Marie Colbin, is an award-winning leader in the field of natural health, and a highly sought-after lecturer and wellness consultant…. and she is funny. Colbin is Founder and CEO of the Natural Gourmet. They are both prolific writers and they speak the truth as is supported by good research. I think one of the best outlines written explaining good food and how to approach it was written by Dr. Colbin. Whole: as nature provides them, with all their edible parts (grains with their bran and germ, apples with their skin – if not waxed) cooked raw vegetables and fruits rather than juices or vitamin pills. Whole foods Colbin says supply all of nature’s nutrients in a team, as well as providing us with the life energy of the food. Fresh, natural, real, organically grown: meaning not canned, not frozen, certainly not irradiated or genetically engineered, free from chemical additives, colorings or preservatives. The foods we choose should be the real thing, full of their life energy, not imitations (such as margarine or artificial sweeteners) which invariably turn out to have some health damaging effect. Organically grown foods not only have been proven to have higher nutrients, but also taste far superior to the commercially grown kind. Seasonal: To be in harmony with our environment, it is a very good idea to choose summery foods in the summer, wintery foods in the winter. Fruits and vegetables in season are cheaper and do not lose nutrients like foods that have been transported long distances. They also taste better. In addition seasonal eating means salads and fruit in the summer and soups and stews in the winter. On the whole, most people do eat this way instinctively. However, with the advent of refrigeration, freezer trucks, and worldwide transportation we can get raspberries in December and yams in July. We also ignore this natural order when we go on restricted diets, such as raw food and juice regimes, which require us to eat lots of fruits and vegetables in the winter or cooked salty macrobiotic meals in the summer. With these diets we go out of sync with our environment, and we might feel cold in the winter, or cranky and depressed in the summer. Local: Local produce is fresher, tastes better and is more nutritious because it is picked riper and does not lose nutrients in travel. The best restaurants in the country have discovered this and make an effort to obtain the freshest organically grown local foods, which they consider top quality. In Harmony with Tradition: We should pay attention to what our ancestors ate and incorporate those foods into our diet where ever possible, maybe with some modifications (less salt, less fat, less sugar) For example, our staple grain will taste more appropriate if our ancestors ate it as well – barley and oats from the British Iles, Rye and wheat from Europe, Kasha from Eastern Europe and Russia, millet, teff and sorghum from Africa, millet and rice from Asia, corn and quinoa from the Americas. Balanced: It’s important to make sure there is enough protein, carbohydrates, fat, and micronutrients in our diet as a whole, and to pay attention to the expansive/contractive, acid/alkaline and the five phase theory system. For aesthetics it is also important to include foods with a variety of flavors, colors and textures. Delicious: There is no point in eating “healthy” food if it doesn’t taste good. Besides, our taste buds can guide us, when encountering whole, real natural foods, to what we need and what we don’t need …and we’d do well to listen. The movement toward eating better is now thought to include a return to what our ancestors ate meaning eating foods grown closer to home in more natural circumstances. It also means getting rid of the sugary processed foods that are killing us. What we are learning in the nutrition field is that the closer the food we eat is to its natural form the better it is for us. My new food mantra is “if it contains more than a couple ingredients it’s probably not good for me.” I shop the perimeter of a grocery store and at open air or farmer’s markets when possible. I read labels incessantly and in reducing my sugar and processed food intake have greatly improved my health. In my health coaching practice I begin by suggesting clients reduce or refrain from eating the following foods: sugar, white flour and other gluten products, animal proteins, processed foods, alcohol and tobacco and in some cases soy products. This simple starting point has assisted many others in achieving their health goals. Though the recommendations are simple the practice is not always so simple. We are used to sweet and salty foods that don’t necessarily taste like the food they mimic. So it is important to be patient with yourself and have someone in it with you who can support you to reach optimal health. This entry was posted in Cooking for Health, Health Coaching, poetry, Uncategorized, Whole foods cooking and tagged Anne Marie Colbin, cooking demonstrations, cooking with children, dessert, Dr. Neal Barnard, friendship, happiness, health coaching, healthy eating, healthy recipe, Institute of Integrative Nutrition, Kushi Institute, macrobiotic, nature, nutrition education, Pittsfield farmers market, recipes, south river miso, tempeh, Unitarian Universalist Church of Pittsfield, vegan, vegetarian, Whole foods cooking, Wild Oats Food Coop. Bookmark the permalink.